How sad that Iowa ranks almost at the very bottom (only five below us) when it comes to animal cruelty laws. Christie Vilsack, we need you! Thank you, Mindi, for creating such a great site and FB group! We’ve all seen the stories on TV and in our newspapers — the ones about starving or abused dogs that somehow managed to survive horrific lives until, almost miraculously, they stumbled or tumbled into some type of scenario where a perfect stranger took notice and came to the rescue. 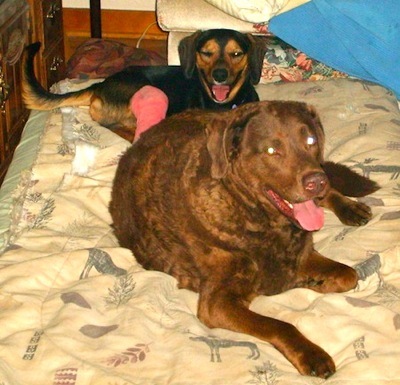 Since my 14-year-old Cocoa died in September 2010 (eight months ago today, in fact), I hadn’t given much thought to getting another dog. After all, we still have 12-year-old Bear, a chocolate Lab, and Hagan, our Chesapeake, who will be eight years old Sept. 1. I hadn’t given the idea much thought until Tuesday, May 17, when I received an e-mail from Sherry Toelle, a friend from Atlantic, Iowa. She wondered if we’d ever got another dog, and whether we might be interested in one a friend of hers — Jane Loew, a social worker, like Sherry — had found on a country road between Atlantic and Exira in Cass County on Friday the 13th. Sherry had attached three photos to the e-mail, and I was struck by the dog’s similarity to my Cocoa; they shared the same colors, similar faces, and were nearly the same size. The dog Jane found had not led a pleasant life. He walked on only three legs, was covered with wood ticks and fleas, and his ribcage protruded from his starving body. His back right leg dangled behind him as he — in no uncertain terms — made it clear to Jane she would never get past him in the road without stopping first. Jane did what most drivers would; she looked around for a farm or home, thinking he might be lost or someone’s family pet who’d been hit by a car. But there were no homes anywhere nearby, and the young dog clearly needed medical attention. She eventually opened her car door, and the dog jumped in using his three good legs. Jane took the dog to the Cass County Animal Clinic in Atlantic, where Dr. L.E. Victora would attend to the injuries and keep him for the weekend. 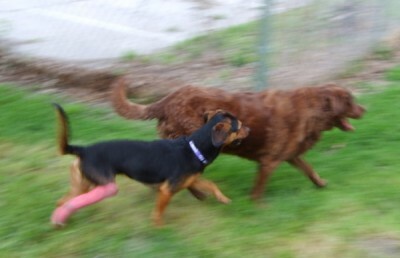 As it turned out, the dog’s right back leg was broken. He’d not only suffered a major fracture of the tibia, but four other cracks in the tibia from the top to the bottom. Dr. Victora estimated the male dog’s age at about one year old. The dog was “such a good dog,” he said, he couldn’t bear to put it down. On Monday, Jane placed the dog with a foster family, and Sherry e-mailed me the following day. We met Sherry and Jane in Avoca on Wednesday, May 18, and I’ll never forget the first time I saw “Jack’s” face. He wasn’t jumping or barking or acting wild, just quietly peeking out at me — much like a small child evaluating his or her new surroundings — from the back seat. His black and brown face was all I could see between the driver’s headrest and the vehicle’s door. 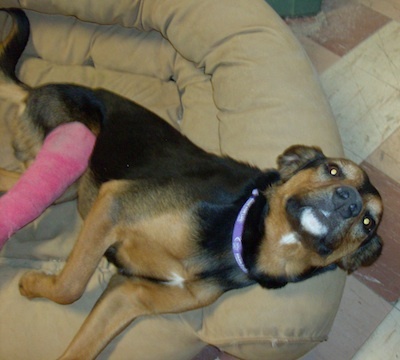 I loved him instantly — even before he got out and I saw the long pink cast on his back right leg. Once Jane and her son and Sherry said goodbye to the little dog, we promised them we’d keep them updated with photos and stories. We would never let them forget about the little black and brown dog. On the way home, we talked more about names while “probably Jack” settled his back end on my lap in the passenger seat, his front legs and shoulders against Dennis and his middle resting on the console. 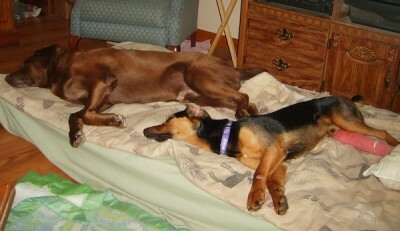 Hagan and Jack take a breather on the (dogs') living room mattress. 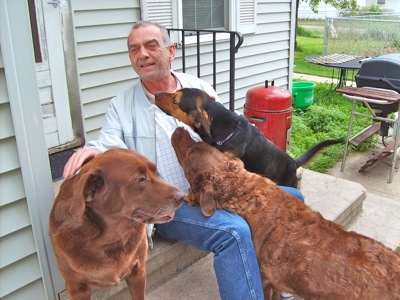 Bear and Hagan eagerly welcomed Jack into their yard, home and hearts. They played for hours, getting to know one another, and when we finally brought them inside, Jack lay happily on the living room mattress (a dog-friendly living room), before finally falling asleep with Bear. At bedtime, we all went upstairs, and while Bear and Hagan settled into the two twin mattresses lying side by side on the floor next to our bed, I lifted Jack up to see if he’d like to sleep with us. He stayed there only a minute, but preferred to spend his first night with Bear and Hagan. Bear and Jack worn out on the first day. I helped him down, secretly wishing he would have chosen to take Cocoa’s old spot on the bed next to me. Just before I turned off the light, I leaned across Dennis to look down at the two beds below. All three dogs lay snuggled up together on the very same mattress … Jack in the middle.